The story of Alfie Evans in the United Kingdom shocked and captivated an international audience. His death on April 28 was tragic, leaving his parents and countless people across the globe heartbroken, including his devoted online advocates in "Alfie's Army." Many things happened during his case. The medical details are complex, with Alfie perhaps suffering from a unique disease. While the details may be hard to follow, the controversy over Alfie is really quite simple: Alfie's medical care was forcibly removed from him because of his quality of life. This was a fight about imposing "quality of life" judgements on the unwilling. If you didn't follow all of the ups and downs of his story the last few months, you really ought to care about how he died, because it could very well impact you soon, or a loved one. 1. Patient choice matters. Parents are responsible for children who can't express their own wishes. 2. Subjective "quality of life" concerns are dangerous for the sick and disabled. 3. Courts took away Alfie from his parents entirely based on their opinion of his "quality of life." His parents were doing nothing wrong or abusive. 4. There was no evidence that Alfie was suffering other than his being alive with a disability. 5. Courts should not take children away from their parents because judges believe death is preferable to disability. Some people are having difficulty grasping the above points, however, or disagree, especially on the first two statements. If you want to read more about Alfie's case, please do so. There are a lot of important issues that deserve discussion. 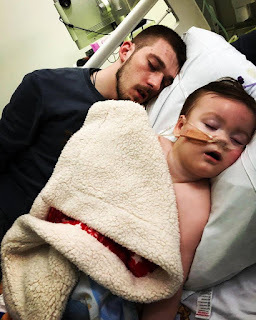 The source of the controversy, however, was the legal fight to force the hospital's care plan over the objection of Alfie's parents, forbidding them to even take him home to die. The purpose of that care plan was to let Alfie die on the hospital's terms because the hospital did not believe his life was worth living anymore. Alfie was only a toddler, unable to express his wishes about what level of care to continue to receive, so instead his parents were responsible for determining his care. They decided it was in Alfie's best interest to stay alive. They made a decision for Alfie that many adults legitimately make for themselves. Alfie's case appeared to be terminal, but that doesn't make it morally wrong or abusive to live out as much life as possible in his parents' care. Medical miracles happen and doctors can be wrong about a diagnosis. How a patient views their health is important, but it's a very subjective value. Unfortunately many doctors, hospitals, academics, and government officials have come to believe that many forms of disability are so insufferable that a person is objectively better off dead. "I wouldn't want those tubes hooked up to me" is quickly turning into, "You shouldn't have those tubes hooked up to you." Even subtle bias in treatment decisions can have deadly effects. Many terminal patients decide to forgo exceptional treatments, and that's their right to do so. Many do not, but more and more those choices are being frowned upon, or quietly or actively blocked. It's one thing to have a broad discussion about good end-of-life decision-making on the frontier of new medical advances, but it's an entirely separate thing to legally coerce someone into dying. You may have decided on a different care plan for Alfie based on the medical facts. But you are not Alfie, nor are you his parents. Neither were his doctors, or the UK courts. Theoretically there could have been good reasons to remove Alfie from his parent's care. Alfie could have been older and communicated that he didn't want to remain on a ventilator. His parents could have been abusive or been keeping him alive for financial interest. Alfie's medical care could have been actually futile. Alfie could have been suffering. None of those were true. The courts simply decided they knew better about what Alfie needed than his parents, and that need was death. This was not a case where Alfie's medical care was futile. Alfie was still able to digest food and fluids. Alfie was not brain dead, obviously proven when he continued breathing on his own for days after the ventilator was removed. The hospital took away his efficacious care so that he would die quickly, and they were clearly shocked when Alfie refused to die. It took the hospital nearly a day to begin feeding Alfie again, and his parents had to beg to have him allowed oxygen. Either the hospital was hoping to speed along his death, or they were shockingly incompetent in delaying proper care. Alfie's case is another dangerous precedent, like the recent Charlie Gard case. Alfie and Charlie are not alone. There was a bone-chilling case where authorities started a manhunt for parents who sought care for their critically-ill son, Ashya. The child survived, proving doctors and authorities heinously wrong. There's been other cases as well. It's encouraging, however, that Charlie's parents are helping to revise laws in the UK so that quality of life values are not just imposed on children. One huge obstacle, however, is the unshakeable faith of those who believe that imposing quality of life views on patients is a good thing, even if the patient expresses their will to live. In commenting on Alfie, Prime Minister Teresa May said it was a great tragedy, but ultimately said medical experts should decide on patient care, not patients or their parents: "It's important that decisions about medical support that are given to children and to others are made by clinicians, by those who are expert in that matter..."
Were the experts who launched an international manhunt to nab Ashya's parents humbled after radiation treatment abroad left him cancer-free? The people who took away Alfie are likely utterly convinced they did the right thing. The sinister nature of a "quality of life" ethic is that those who believe people are better off dead feel completely morally justified in the death of human beings. They are blind to the dangers of their beliefs. Removing care or giving people lethal doses of drugs is cheap, whereas caring for the sick and disabled can be very difficult. People have a habit of taking the easy route, sometimes even if it harms other people. Now the easy route has a worldview justifying even causing death as compassionate. Restoring a belief in the fundamental value of human life is what the prolife movement is all about. We'll continue to fight for it, in memory of Alfie, Charlie, and others like them. "Our beautiful soldier, your stubbornness will carry on through your beautiful Mum Kate, your strength you found from your hero your Dad: Both sides of the family are shattered. Never has there been a boy so beautiful special and precious as you are. Hearts are broken all over the world. Your cousins miss you so much. The tears that are shed are for the love we all have for you. It’s never goodbye, its until we all meet again. We love you Alfie we do, we love you Alfie we do, we love you Alfie we doooooo oh Alfie we love you."